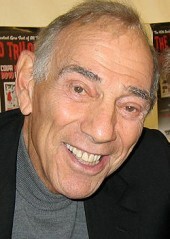 Exploitation filmmaking legend Herschell Gordon Lewis talked up the release of his The Blood Trilogy on Blu-ray (Anchor Bay, $17.97, released Sept. 27, 2011) in a lively, free-wheeling phone conversation with Disc Dish. The Blood Trilogy consists of Lewis’ 1960s grindhouse film classics Blood Feast, Two Thousand Maniacs and Color Me Blood Red. Released at the same time was the 2010 documentary Herschell Gordon Lewis: The Godfather of Gore on DVD (Image Entertainment, $14.98). Frank Henenlotter’s The Godfather of Gore documentary is informative and a lot of fun, but I think I learned more about Lewis from my rapid-fire 15-minute phone chat with him. The 82-year-old creator of the splatter film proved to be sharp, funny, worldly, self-deprecating and definitely on his game — just as an exploitation king should be. After pleasantries were exchanged, I asked Lewis about the effect his hop-skip-and-jump life and career — which found him living and working every from Pittsburgh, Chicago and Oklahoma City to Racine, Wisconsin and Starkville, Mississippi — may have had on his filmmaking. From that starting point, we steered into as nearly as many different directions as there were cities in my question. Disc Dish: Herschell Gordon Lewis, you’re a real journeyman — both artistically and geographically. Herschell Gordon Lewis: I’m very pleased to have had an eclectic background. DD: Did living in so many different parts of the country affect your filmmaking? HGL: That’s a very astute observation! DD: If you’re answering ‘yes,’ then thank you. HGL: Well, then it’s an astute question! I’d have to say that my kind of background tends to purge away the idea that anything I’ve done is “golden.” And what I’ve seen and done — the consequence of things — has gone into the creative product I’ve excreted. DD: You’re not coming down on the places that you’ve lived, are you? HGL: No, no, not at all. But the reactions to the movies speak for themselves. Maybe it’s more about where I came from in my head. After I made Blood Feast, I was an outlaw. We were criticized by nearly every motion picture publication and film society in the country. ‘How dare we make a movie like that! ?,’ they all screamed. DD: Okay. And where are you living now? HGL: Pompano Beach, Florida. I’ve had enough of cold weather. DD: You knew them all for years and worked alongside of them at times…. HGL: Well, they didn’t do what they did as well as I did! The red stuff flows in 1963's Blood Feast. DD: Since your “retirement” nearly 20 years ago, you’ve made a handful of movies, alongside a zillion other horror and exploitation filmmakers who are all basically doing their own version of your thing. HGL: My whole trick was to walk away! I don’t want to be known as the kind of fella who made Scream... and the next Scream, and the Scream after that. The same movie over and over again. We didn’t do that. We broke a new bottle of champagne each time. Cheap champagne. DD: And buried in that broken glass are your movies, nearly 40 of them. That’s quite a filmmography. DD: But it’s preserved, it’s still here. Just like your films, first on DVD and now on Blu-ray. HGL: Exactly. That they still exist now is amazing, a bunch of ancient movies with a cast of nobodies! And they’re still showing. They’re part of film festivals every Halloween. DD: So your legacy is ensured. HGL: They’re not classic movies. I know that. But just like Columbus claimed he was the first one to “do it,” so can I. They’re not classics. But I’m in a footnote to motion picture history, and I’m proud of that.